Europe is dominated by two main large features, one being an extensive ridge across SSE part (an intense heat wave) and the other feature being a large upper trough sitting over W Europe. In between, a powerful jet streak (70-80 knots at 500 mb) travels from SW Europe across Germany into Baltic sea with an embedded short wave rapidly moving from N France across Germany – it serves as a focus for a robust severe weather outbreak to occur. 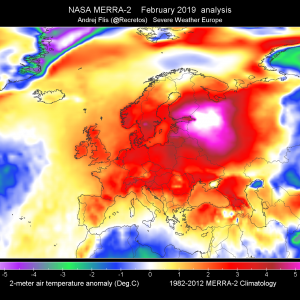 Another short-wave affects E Iberian peninsula while yet another one affects parts of Scandinavia. At the surface, a diffuse frontal zone extends from N Spain across France, N Germany into NW Poland with a warm front advecting towards the Baltics. A HIGH risk has been issued for NE Germany into NW Poland with threat for severe to extremely severe damaging winds (derecho event possible), tornadoes, very large hail (locally 7+ cm possible) and torrential rainfall. With advection of very warm and humid airmass from central Europe into these areas, very strong instability with MLCAPE locally above 2000 J/kg will develop and perfectly overlap with very strong shear in range of 60-80 knots. Favorable LL wind field across the warm sector will provide helical environment and support up to 200-300 m^2/s^2 of 0-3 km SR helicity. Storms are expected to develop when the diffuse front pushes across N-CNTRL Germany by mid afternoon and the capping inversion weakens after convective temperatures are reached. Storms will rapidly organize into intense supercells, including tornadic supercells supportive for very large damaging hail, severe winds and tornadoes. Locally, more discrete cells could result in some giant hailstones or a strong tornado as well. With time, storm coverage and intensity will enhance and discrete cells should merge into one or two large storm clusters. These will likely take place in far NE Germany by late afternoon / early evening and spread into NW Poland through the evening with mainly widespread damaging winds potential – a derecho type event cannot be ruled out given the rather strong forward motion vectors, fueled by moist southerlies ahead of the cluster(s) and indeed still being within the very strong shear/helicity. Activity will continue into the night hours while spreading towards the NE across N Poland and the Baltic sea. A HIGH risk has been issued for extreme E France into SW Germany with threat for scattered storms capable of producing large destructive hail, severe winds, torrential rainfall and to a lesser extent for tornadoes. Very high to extreme instability (MLCAPE locally in excess of 3000 J/kg) with near-20s dew points will provide a volatile environment for explosive storm development when the capping inversion weakens by mid afternoon. Placed under a very strong mid-level jet streak and shear (60-70 knots DLS), storms will organize into intense supercells, mostly isolated to discrete in nature. Storm motion should be pretty rapid once storm cells gain mature stages and spread towards SW Germany. Extreme instability and 60+ knots of deep-layer shear will support very large to locally giant hail, severe winds and when clustering into one or two large MCSes takes place, also extremely severe damaging winds and locally flash floods. LL helical conditions will be less favorable for LL rotating storms, so tornado threat within these areas is limited. MDT/ENH risks have been issued for areas surrounding the HIGH risk areas from ESE France across north-central Germany into NW Poland and Baltic sea and S Baltic states with threat for severe damaging winds, large to very large hail and torrential rainfall. Convective coverage within the ENH area should be limited compared to MDT/HIGH risk areas while conditions are relatively similar and supportive of damaging severe weather. Especially in between the HIGH risk areas a broken line of storms could occur along the eastwards moving front. 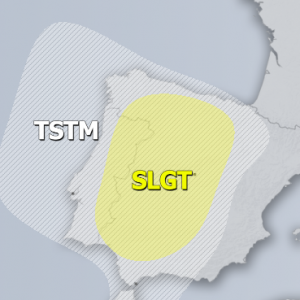 An ENH risk has been issued for SE Spain with threat for a few isolated severe storms which should organize into intense supercells given the strong shear and high instability in place. Very large hail, severe damaging winds and tornado or two will be the main threat with these storms. 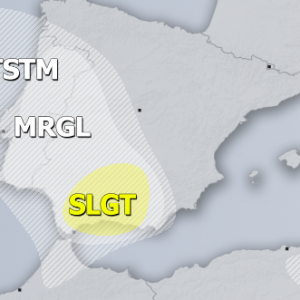 A SLGT risk has been issued across E Spain, south-central France, E Benelux, Germany, NW Austria, W Czech Republic, north-central Poland, S Sweden, Baltic sea into Baltic states and Belarus with threat for more isolated storms, capable of producing large hail, severe winds and torrential rainfall. 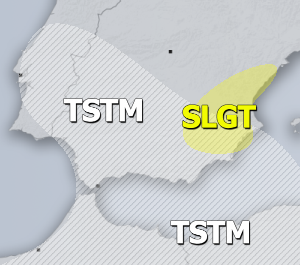 SLGT risks have been issued for N Algeria and Georgia with threat for isolated (mostly diurnally driven) severe storms. Moderate shear and instability will support some large hail and severe winds threat. 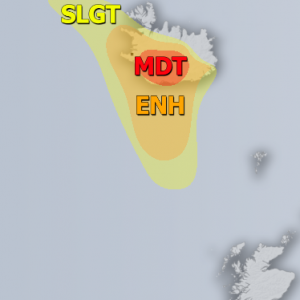 MRGL risks have been issued for north-central UK and N Sweden where conditions are supportive for some chance of severe weather, but very limited coverage given the low instability in place, strong shear could lead into some marginal hail or strong/severe wind gusts.